"Dr. Smith is the most caring doctor I have ever met. He is brilliant & knows his work." "Every one of my visits I have received professional & excellent care in a timely manner." "Great Dr. Great staff. He actually helps you and spends time talking to you." "Staff was amazing and Dr.Smith was great." "He listens and helps out instead of like other doctors." "Dr. Raleigh Smith is a great doctor. He has a wonderful bedside manner." "He's a great person and awesome doctor who actually listens to his patient's concerns." "Very professional & always has our best interest/results in mind. I recommend Dr.Smith." "The entire staff has always taken my concerns seriously as if i were family." 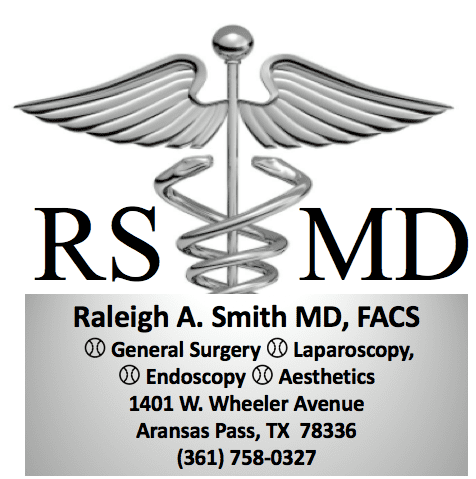 Raleigh A. Smith, MD, FACS, is a board-certified general surgeon serving men, women, and children at his self-titled clinic in Aransas Pass, Texas. From comprehensive medical care to urgent care, surgical care, and medical aesthetics, Dr. Smith provides a wide range of services to help patients with many conditions, illnesses, and injuries. With a whole-person approach to health care, Dr. Smith is emphatic about individualized care, and he strives to know all of his patients personally. He operates with the knowledge that every problem has a root cause, and he works diligently to diagnose underlying issues and develop a custom plan for treatment. After receiving his medical degree from the University of Texas Southwestern Medical School, Dr. Smith continued his education with an internship and residency at St. Paul Hospital in Dallas, and a second residency at West Virginia University in Charleston, West Virginia. The clinic welcomes new patients for primary care, urgent care, general surgery and aesthetic treatments. Call the office to schedule a personal consultation with Dr. Smith or book your appointment online. "Talented physician. He cured a back problem that I had suffered with for 20 years." "New staff is wonderful, Dr is amazing. Feels like a little family and doesn't treat you as a number... I'm not going anywhere." "Outstanding all the way. Courteous and professional staff." "I've known Dr. Smith for about 12 yrs and he's a great Doctor and Surgeon. I trust the man, and the fact that he is upfront and professional about any issues." "Best Doctor in this area. Great staff, I love them all. They are very professional and the office is very nice. You should give them a try." "I found Dr. Smith to be personable, efficient and quite capable of handling my medical needs. I have already made a second appointment with him." "Dr. Smith is the most amazing doctor ever. He is a first class kinda guy. He is very informative, and he has a fabulous bed side manor. I love him & his whole staff." "I'm very pleased with Dr. Smith, he takes the time to listen. and I appreciate that." "Dr Smith is absolutely the most professional doctor in the country! If you need a surgeon I highly recommend him!